In keeping with its mission to educate, entertain and inform, Georgia Public Broadcasting creates content and experiences "worth sharing." Situated in the natural hub that is Midtown Atlanta and only fifteen minutes away from Hartsfield-Jackson Airport, our high-definition production facility was designed and commissioned for the benefit of the community. Ease of use and accessibility are our hallmarks, with a spacious studio layout and designated parking for the full production fleet: production and grip trucks, catering talent trailers, and crew. At the intersection of production and hospitality, there you'll find Georgia Public Broadcasting. 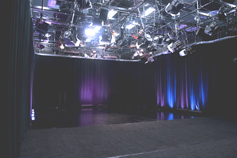 * All studios come complete with a full lighting complement and are controlled by a dimmer per circuit lighting system.